Coming from Bokhara (Uzbekistan), the motherland of thousands of Islamic scholars and Muslim Saints, he joined the army of Sultan Nasir al-Din Ahmed Shah (reign 1411-1442 C.E.) who had founded the city of Ahmedabad. He Made pardah from this world as a martyr, defending Islam at a very young age. Hazrat Muhammad At-Taqi ( Razi Allahu Anhu ) is the 9th Imam. Hazrat Sayed Ali Mira Datar belongs to his family. He is from Husaini Family. He was born on Idd moon chand night and On Eid day there is his Ghusul (Bathing) Ceremony in the Mazar Sharif (Tomb). There is a great celebration on his Birthday. On the day he was martyred dated 29th Moharram, there is Urs mubarak at 4.00 am in the morning, Also there is Sandal Mubarak where Lacs of people gather around the Mazar shariff to be rewarded their rightfull needs. There is Luban (Fragrance ceremony) at 5.00 am and in the evening after maghrib Namaz.People ardently attainding morning and evening Loban ceremony are rewarded tremendously. from Bukhara, Uzbekistan to a village of Lukhnow (India). Kutbe Alam was very much pleased on meeting Ilmuddin and he introduced him to King Ahmed Shah who letter recruitted him in his Army at post of Commander in Chief (sipesalar). Ilmuddin was a very pious man. He lead all his companion on the rightfull path of ALLAH the only One. Shown by talimat of Sunnah of Mohammed (sallala hu ali wasslam). So many soldiers became disciples (Mureed). Iman ki roshni main log mala mal ho gaye. Hazrat Sayed Ilmuddin's son named Sayed Dost Muhammed was married to Aisha Bibi who is known as Jannati maa or Rasti maa, sister of Sabai Burhani. She was very pious & rightful. She belongs to a Sufi Faimily. Her nearest relatives meternal as well as paternal were all Walis And Auliyas. Dost Mohammed was very bold & brave man master of sword. King Ahmad Shah liked him very much as he also was a succcessfull warrior. He lived at Kanpur where a son was born to him and he named him "Abu Mohammed"
After some time in the month of Ramzan, HAZRAT SAYYED ALI MIRA DATAR was born . His Face was glittering with the Sprtual lightning (noor) His place of birth was Sayyedwada of Ahmadabad KANPUR. He was born as a wali While he was 3 years old, King Ahmad shah ordered his father Dost Mohammed to curb the rebellion and decoits around Patangaon. Unnava was known as Lilapure in those days. For going to patangao Lilapure was the way, and he had to cross Lilapur whenever he wanted to reach patangaon and so he made a house there. After successfully completing his job all the people lived there happily. During this time Mevason was also won by Aby Mohammed. Sayed Ali was 10 month and 16 days when his mother Jannati Maa expired on Friday 16 rajab 880 Hijri Sayyed Ali was under nourishment of Daulat Bibi urf Amma & Dadi Amma. Mazar of Dadi Amma and Rasti Ammi is in Usmaanpura Ahmedabad. Miracle of Sayed Ali commenced from childhood (bachpan). He was weeping for milk, Dama amma embraced him praying to ALLAH Subhana Taala that if I was having Milk I would have fed him. The moment she prayed it was accepted in the Darbar of ALLAH Subhana Tala and she got milk. She feeded him happily on seeing this everybody was astonished. They were sure that this is from ALLAH Subhana tala. After that his father Dost Mohammed married her. He was brought up under Daama Amma, Dadi maa and Dadajan. He took his basic education from Dadajan at Ahmadabad. He was very pious man. He spent most of his time in Ibaadat of ALLAH subhawa taala and Studie of Hadees and Sunnah. Whoever brought any difficulty to Sayed Ali he used to solve any problem immediately. There was spiritual power in his tongue. What ever he prayed it was accepted very soon. On seeing this so many people accepted Islam. His speech and actions was all according to pleasure of ALLAH Subhanatala along with preaching of prophet Muhammed Sallalah Alai Wasdallam. Sayed Ali was a great lover and cherisher of Imam Husain ( r.a.) and he always wanted to be a Martyr (Shaheed). “Think not of those, who are slain in the way of Allah, as dead. Nay, they are living. With their Lord they have provision.” (3: 169). “And call not those who are slain in the way of Allah ‘Dead.’ Nay, there are living, only ye perceive not.” (2:154). Before we speak of the martyr saint, it will be relevant to give at least a sketchy glimpse about Jinns and demonic possessions. It is not unknown that in the Islamic world Jinns and demons and their possession are commonly accepted. The Holy Quran has a whole chapter named after The Jinn who have been created out of the searing fire. Some of them are Muslims and some are deviated who follow different paths. In fact various Surahs of the Holy Qur’an have some verse or another about the Jinn. The prophetic traditions of the Holy Prophet (s) are also replete about the knowledge of Jinn and their kinds and about the ways to seek protection from them. Satan or Iblis was from among the Jinns. Ibn Taimiyah also confirmed the position of the majority scholars stating that the existence of the jinn was an established fact according to the Qur’an and the Sunnah and the agreement of the early scholars. The Jinn too are accountable for their good and bad deeds before Allah. Scholars have categorised the Jinn into a resident Jinn called Amaar, a malicious and wicked Jinn called Shaytan; the jinn stronger than shaytan is called Ifreet, while genie is one type of Jinn; and those antagonising young boys are called arwaah. There are various types such as those who fly in the air with wings, those who are in the shapes of creatures such as snakes, dogs, scorpions, lizards, etc. and those who rest in one place and then resume their journey. Regarding possesson of a human body by a Jinn, scholars inform us that there is a consensus among Sunni Muslims that Jinn can dwell inside a human body. Ahmed Ibn Hanbal has categorically stated that those who deny that a Jinn can enter into the body of a human being are lying. Not only the human but also other objects, things, trees can be possessed by a Jinn. Demonic possession should, however, not be confused with medical ailments like epilepsy. However, again, all fits of madness may not be epilepsy but simply seizures by evil earthly spirits . It is in this state that the afflicted person may do things which are not normally done by a normal person. The person may, for example, speak a strange language, or lift a very heavy object, may remain motionless or may go on shaking the head, or keep running to and fro, or hurling abuses and screaming and so on for hours on end. If a person becomes possessed then the name of Allah is to be invoked on him and supplications need to be made to heal that person. Some of the well-known Quranic verses that are ordinarily used by general Muslims for protection from or repelling of mischievous Djinns are the Ayat-al-Kursi or the Throne Verse (2:254-255) and the last two Surahs, namely, Surah Falak and Surah Naas. There have been recorded instances of professional exorcisms and many have just gone unrecorded. The Holy Prophet (S) used to only say: “Get out enemy of Allah. I’m the Messenger of Allah”. Now, Hazrat Sayyad Ali Mira Datar (Radi Allahu anhu) was born on or about Sunday, 4th August 1426 C.E. Coming from Bokhara (Uzbekistan), the motherland of thousands of Islamic scholars and Muslim Saints, he joined the army of Sultan Nasir al-Din Ahmed Shah (reign 1411-1442 C.E.) who had founded the city of Ahmedabad. He died as a martyr, defending Islam at a very young age. The Dargah Shareef of Hazrat Sayyad Ali Mira Datar’s (Radi Allahu anhu) is located in a fort-like structure in Unava Village on the banks of River Pushpavati in Sidhpur Taluka of Mehsana District of the Western Indian State of Gujarat. Unava is about 5km from the Unjha Railway Station of the Western Railways. It is about 70 km from the City of Ahmedabad and it takes about three hours to reach Unava by a bus or a cab from there. Owing to the miraculous powers of healing, the honorific of “Mira Datar” came to be added to the name of Hazrat Sayyad Ali. The word, “Mira” means “The Brave One, ” and “Datar” (or Daata) means “Giver” or “Bestower”. This shrine is known for driving off evil forces and healing the ones, especially the women who are possessed by demons and evil Jinns. The possessed ones would generally try to run away rather than approach the shrine out of fear. It has been reported that once the possessed woman nears the silver crypt, the clash between the saint and the demon throws the woman into a trance. Over the centuries, the mentally affected or "possessed" Indian women have found a sanctuary here. The fame of this Dargah is spread far and wide and people of all religions, caste and creed visit the shrine round the year with offerings of ‘Chaadar’ and for fulfilment of their vows. Fragrance of roses and incense greet the visitors' nostrils. Roses, too, are offered at the shrine. 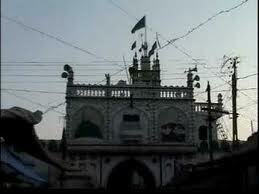 The annual ‘Urs’ is held on 29th of Muharram every year.